Tukur Yusuf Buratai bought a second choice property in Dubai, the United Arab Emirates, days after his appointment as Nigeria’s Chief of Army Staff (COAS), an investigation by SaharaReporters has revealed. As this news website exclusively revealed last week, General Buratai and his two wives in 2013 paid the sum of 1,498,534.00 AED (N120 million/$419,000) for the first property, Project TFG Marina Hotel Unit 2711. Sale documents indicated that the first property was handed over to the Buratais on January 13, 2013. On July 13, 2015, President Muhammadu Buhari appointed General Buratai as Chief of Army Staff. Our investigations show that, within 11 days of his appointment, the general was making arrangements for the purchase of a second property from the same company in Dubai. Our investigators obtained evidence that, between July 24 and August 17, 2015, General Buratai paid a total sum of N42.2 million into TFG Sigma 111’s account in Nigeria (Skye Bank 1770380452). Our sources within the Army disclosed that the lodgments came from Army funds stolen and diverted by General Buratai. They explained that the diverted monies were taken from funds budgeted for the feeding, medical care and payment of allowances of soldiers fighting the war against Islamist insurgents in Nigeria’s northeast zone. Angered by the deplorable state of the vehicles and motorcycles, a group known as Concerned Soldiers and Officers From The Northeast petitioned President Muhammadu Buhari to demand an investigation into the financial malfeasance perpetrated by General Buratai. A member of the group told SaharaReporters that they want President Buhari to ask General Buratai to explain where he got money for his various assets, including the real estate in Dubai. He said the COAS also owns a huge industrial-scale farm, Tukur and Tukur Farm Limited, on the Abuja-Keffi Expressway. “The farm is currently a huge construction site, featuring a tarred road, a zoo, a guesthouse, chalets, a restaurant, a cinema hall, a mini-stadium and other leisure facilities,” said the source, adding that some of the equipment on the site belongs to the Army. In a statement issued last Friday, Colonel Sani Kukasheka Usman, acting Director of Army Public Relations, claimed that General Buratai and his family own two properties in Dubai that were paid for in installments through personal savings. But Colonel Usman’s claim that the two homes were bought three years ago is at odds with purchase documents seen by SaharaReporters. Colonel Usman also stated that General Buratai was a victim of a campaign of calumny. Purchase documents for General Buratai’s first property in Dubai showed that the COAS and his wives paid for Project Marina Hotel Unit 2711 in one lump, instead of by installments. Their single payment earned them what the sellers, Sigma 111, called “incentives, promotions and early payment bonus.” Owing to the lump payment, the sellers shaved off AED 43,466 from the AED 1,542,000 that was the asking price for the property. General Buratai paid AED 1,498,534 for the first property. The cash lodgments into Sigma 111 Skye Bank account also suggested that General Buratai did not buy the second property three years ago, as Colonel Usman claimed. The dates of the payment showed that money started gushing into the account eleven days after Buratai’s appointment as Chief of Army Staff. Colonel Usman also claimed that General Buratai had always declared the two properties as parts of his assets. But such claims are hardly cast-iron proof of fidelity to the laws on declaration of assets. Public officials regularly claim to own assets they have not bought. Similarly, Colonel Usman claimed that General Buratai was never a Director of Procurement at the Defense Headquarters. Yet, evidence from the website of Bureau of Public Procurement (BPP) proves the military spokesman wrong. 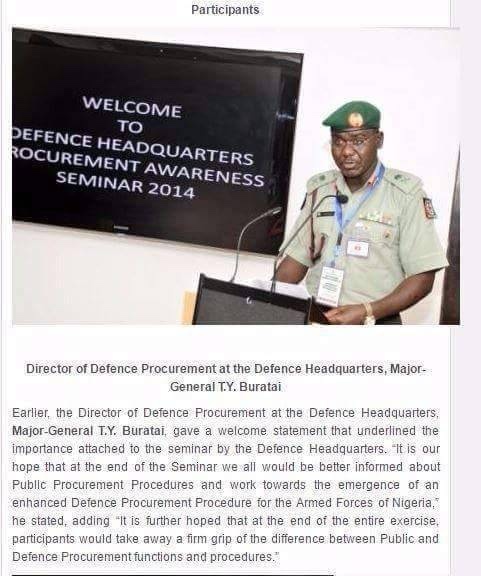 According to the site bpp.gov.ng, General Buratai attended the 2014 Defense Headquarters Procurement Seminar as the Director of Procurement. Several retired and serving Army officers told SaharaReporters that General Buratai seemed to be getting away with his financial misdeeds because of a growing culture of corruption in the armed forces. They point to the case of Major-General A.B. Abubakar, the current Chief of Administration at the Army Headquarters. According to two sources, General Abubakar was never sanctioned after he reportedly misappropriated huge sums meant for the equipping and training of re-absorbed soldiers based in Kontagora, Niger State. Another military source cited Brigadier-General Momoh of the Department of Logistics, Army Headquarters who reportedly diverted millions of the Army’s funds to his private account. “His only punishment was redeployment to the Training and Doctrine Command (TRADOC) of the Nigerian Army,” said the source. Yet another military source drew attention to the case of one Colonel Jega, who reportedly placed 101st at the Defense College exams. Yet, the colonel got preferential treatment and was sent to the Defense College in Bangladesh, ahead of those who performed much better than he. “Some of those who did better in the exams were even retired,” our source said.